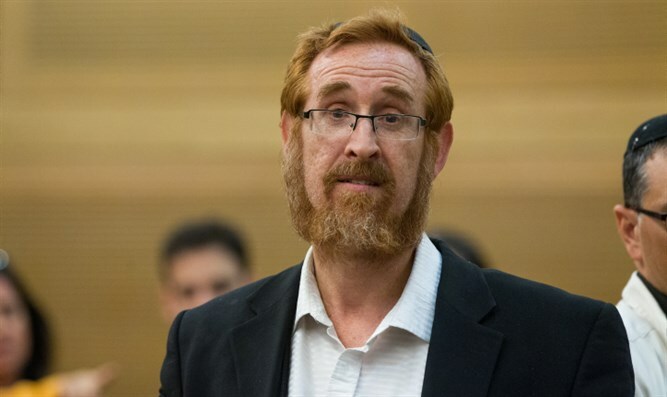 MK Yehuda Glick came to ruins of Migron, evacuated four years ago today, and asked "Why was this place destroyed? Not one millimeter of it has been developed. Who gained from it?" MK Glick said that "I am standing in the place which until exactly four years ago was a living, vibrant, flourishing community. Tens of families lived here for years and were evacuated because there was a terrible wailing that this is private property, " said Glick cynically. "Migron was evacuated due to those demands [of leftist NGOs claiming that it was private land] and here we are four years later and what is there here? Desolation. Who gained from this? Not one millimeter has been plowed or sown, there is no construction here and no individual family has come forward to say it is theirs. Nobody." Glick explained that the motive of those who wanted to destroy the community was hatred. "Whatever happened here served to satisfy the appetite of those who hate Jewish settlements and communities. They had one goal: Not concern for the 'poor person' whose land had been stolen because he probably would have preferred compensation, but rather rejoicing in other people's misfortune and the hope of evacuating a Jewish community." Glick wished to draw an analogy from Migron to other pending cases, "Today when the same questions hang over Amona, Ofra, Gush Etzion and all the other communities, I ask who could rejoice in evacuating communities? If there is a private person who could prove that it belongs to him, let him come and receive compensation, but why remove families who have lived here for years? Who can benefit from this? I ask again - why destroy it?" There is no evidence that the disputed land in Ofra, Amona, etc belongs to any specific Arab Palestinian.